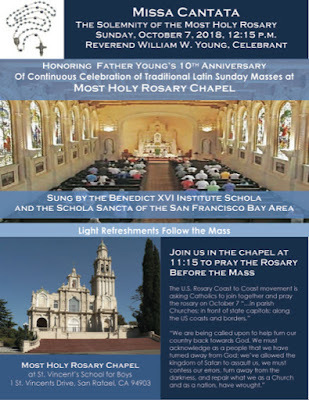 The chapel of the Most Holy Rosary in San Rafael, California, will have a Missa cantata for its titular feast, on Sunday October 7th, sung by the schola of the Benedict XVI Institute and the San Francisco based Schola Sancta. 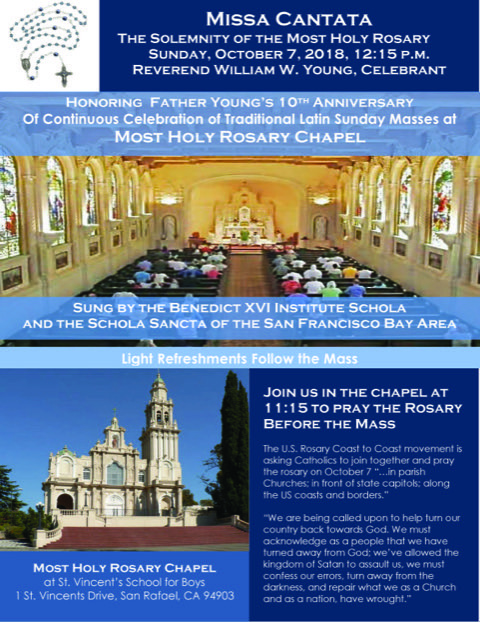 The Rosary will be said before the Mass, starting at 11:15, in conjunction with the US Rosary Coast-to-Coast, with the Mass itself beginning at 12:15. The liturgy also marks ten continuous years of the traditional Mass being celebrated in this church by Fr William Young. The church is located at St Vincent’s School for Boys, 1 St Vincent’s Drive.